(Phys.org)—Passwords are the bane of 21st century life. But Bionym, a Toronto-based tech start-up, promises to change that. Founded by recent University of Toronto graduates Foteini Agrafioti and Karl Martin, the company develops biometric software. Its latest project may change the way we secure our digital information in the near-future. The secret is a heartbeat away. Literally. "HeartID is currently the only commercially available biometric authentication solution that uses the cardiac signal," says Agrafioti. 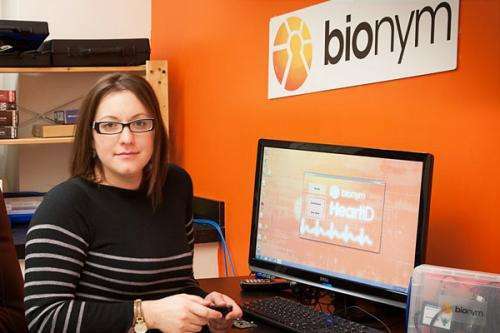 Bionym's HeartID software detects and distinguishes a person's unique heartbeat (cardiac signal) through sensors. The technology can be used to secure various devices with an accuracy greater than 99%, roughly the same as current fingerprint-enabled security systems. But while fingerprints require an intentional swipe, and facial and iris recognition software requires careful positioning of a person's face in front of a camera, a heartbeat is much more foolproof and convenient. Bionym is located in the U of T's recently launched Banting and Best Centre for Innovation and Entrepreneurship, which supports entrepreneurs turning lab research discoveries into products and companies. Bionym is just one of more than a dozen start-ups taking advantage of the centre's access to resources and mentorship opportunities. A demonstration model of HeartID at Bionym's headquarters shows how the technology works. By gripping a device resembling a computer-connected mouse with built-in sensors, the PC recognizes the authorized individual's unique cardiac rhythm and allows them to log-in without having to enter a password. "By embedding sensors into devices, a person can be seamlessly and continuously authenticated during normal device usage," says Agrafioti. Continuous monitoring means that if an authorized user logs in with the controller and hands it to unauthorized user, the computer will recognize the difference and immediately log off. "We're looking to usher in a new era where our devices will know who we are, enabling automatic personalization," says Agrafioti of her software. "Imagine using the family tablet, gaming device, or even car, and having it know who is using it, and loading all of their settings and accounts automatically." In the future, parents may never again have to worry about their unlicensed teenagers taking the family car out for a spin. Bionym is in the early stages of licensing HeartID to hardware manufacturers and could soon be used in video game controllers, tablet computers, cell phones, and even firearms and automobiles, says Agrafioti. The algorithm behind HeartID evolved from Agrafioti's doctoral research in Electrical and Computer Engineering, which she completed under the supervision of Professor Dimitrios Hatzinakos along with co-inventor Professor Francis Bui. After the team developed the technology in the lab, it was transferred to Bionym, where it was commercialized into HeartID. Along the way it was helped by the U of T's Innovations and Partnership Office (IPO) which assists the university's research community in building successful partnerships with industry. Kurtis Scissons from IPO assisted Bionym by seeking funding and managing the intellectual property protection process during the project's initial stages. He has high praise for Bionym's unique and innovative technology as well as the entrepreneurial passion of the founders. "They both possess the right balance of technical prowess and business drive to succeed," says Scissons. So does Agrafioti have any advice for technopreneurs who want to turn their research in the lab into creations that improve lives? While commercialization of technology seems overwhelming, especially for researchers without business training, there are others with the skills you need, she says. "Reach out and find yourselves a partner," she advises, "U of T commercialization services are extremely resourceful and its definitely the place to start."